As this paper flower bouquet is so simple and quick to make we think it makes a lovely craft project to do with children, giving them great results in next to no time. They could make them as a gift for a teacher or family member – or how about for Mother’s Day? Choose a selection of colours that blend and work with each other, for instance we’ve used spring-like brights in the image above, but you could use tones of the same colour for a more sophisticated, less playful, look. 1. 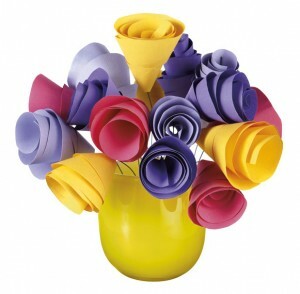 To make a paper flower: Cut a 15cm square of coloured paper and draw a spiral – similar to a snail’s shell. Allow the end of your drawing to run off the paper, cut a line from this point towards the centre, stopping at the next circular line. Cut along the line from the outside and continue until you’ve reached the central point. 2. Starting at the outer end, roll it tightly in on itself, keeping the inner edge tightly coiled, but allowing the outer edge to sit a little looser. 3. Apply a small drop of glue to the outside short edge of your paper and stick it to the section of cone behind it. 4. For a stalk, take a piece of Oasis wire and slightly bend the first 3cm of the top of it, dabbing on a bit of glue. Insert this into the centre of the flower, press down on to the paper and hold for a minute until dry. Arrange in a simple vase, bottle or jam jar. Woman’s Weekly reader Jan Quinton sent us this wonderful snap of some paper flowers that her daughter made. 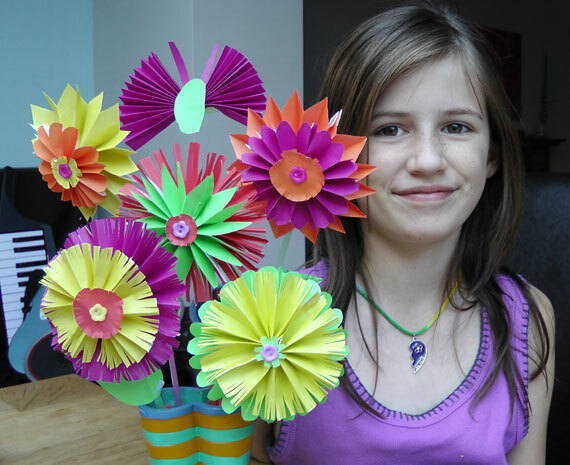 ‘My daughter Freya was inspired to make these lovely paper flowers from the kids summer craft pull-out in her grandma’s Woman’s Weekly while my mum was visiting last week,’ says Jan.